One of the biggest misconceptions about new decks is that they don't need to be cleaned prior to staining. This couldn't be further from the truth. Every piece of new lumber has a coating of mill glaze on it that protects it throughout the production process. It can be removed by washing it with a deck cleaner or leaving it to weather for several months. New deck wood is also very high in moisture content. You may have noticed how heavy a new piece of wood is compared to a more aged piece. Sealing a deck too soon can trap this moisture in the wood resulting in mold and mildew and even wood rot. Depending on the brand of stain, you must allow new wood to "weather" or age for several months before washing and staining it. Some believe that a new deck must weather for an entire year before you can stain it. In most cases, this is a myth and truthfully most of the water and sun damage can occur to unprotected wood in the first year. Ideally, you want the moisture content to be 10-12 percent or less before cleaning and sealing it. This can be checked easily with a moisture meter. During the hot days of summer, if a deck has plenty of sun exposure, it may only take new wood 3 months or so to dry enough for sealing. Once you have determined that a newer deck is ready to be protected the first step is to wash the wood with a quality deck cleaner. The sodium percarbonate deck cleaners in the powder form are very effective and will make your job easier. Apply the deck cleaner with a pump sprayer and use a stiff brush or pressure washer to clean the wood. You want to remove all the dirt, grime, mill glaze, and any graying that has occurred. Follow the cleaning process with a deck brightener application. Most deck cleaners contain caustic soaps that will darken the wood. 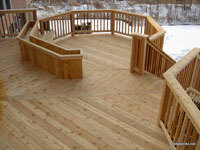 Applying a deck brightening product will neutralize the cleaner and enhance the beauty of the wood. Deck brighter also restores the proper pH level so the new deck stain will penetrate properly. Allow the wood deck to dry for a couple of days before applying deck stain. Using a leaf blower or broom clean the deck of any debris that may have fallen on it. It is imperative that you use a quality deck stain on new wood. Newer wood is denser than aged wood and only a quality deck stain will penetrate the wood pores to provide maximum protection. Follow the direction on the stain can for proper application and coverage rates. Allow the deck stain to cure for several days before use. Prepping a new deck for stain is not hard but it is crucial to the deck's longevity. Knowing how and when to start the process is the key. Please ask any questions you may have below. You must allow the new wood to "weather" or age for several months before washing and staining it. Some believe that a new deck must weather for an entire year before you can stain it. In most cases, this is a myth and truthfully most of the water and sun damage can occur to unprotected wood in the first year. Ideally, you want the moisture content to be 10-12 percent or less before cleaning and sealing it. This can be checked easily with a moisture meter. During the hot days of summer, if a deck has plenty of sun exposure, it may only take new wood 3 months or so to dry enough for sealing. Let it weather for 2-3 months. Clean and brighten for prep. Sand first then clean and brighten after for the old deck. I need to sand my old deck - should I do it before I apply the cleaner or when is the best time to do this? I need to sand my old deck to smooth out some rough spots. Should I do this before I apply the cleaner and brightener or when? hemali, best to clean and brighten the wood for the prep with the Restore A Deck Kit. Stain with Armstrong Clark stain. We had a pressure treated pine deck built in Aug. 2013 and let it weather over the winter months. When I sprayed down the deck yesterday with water, water still beads on the surface. There is no sign of mildew, mold, or graying wood. Would using only the Brightener help to prep the deck for stain? I was hoping to stain before the summer months. Thank you! Jim, if the wood is smooth then yes. If rough sawn, you can stain right away without the prep. is this true for new cedar fences too? I've been trying to read through the comments to avoid having to write this. However, I remain confused, and reading 900 or more entries is tiresome. So, I have a large new cedar deck already installed. I've done nothing to the surface. It has a good deal of direct sunlight on 1/2 of the deck. I want to use the TimberOil because of the paraffins. I realize I'll need to clean, but not sure if I need to brighten. I hope to have this done this October which will be about 6 to 8 weeks after installation. What do I do? Also, are the sample kits available and how much are they? Thanks for your help. I would not seal all sides. No need. Look at Timber oil Brand if you want to stain soon. With Defy you would need to wait 3-6 months and clean/brighten to prep. Brand new 5/4 x 4 western red cedar on a rental house. No time to space/stack wood and let it dry. Not much interested in drying/cleaning/brightening process on this rental. Should I seal all 4 sides before installation? Wait and seal only the top later in the summer? Best product to use? (I have been using Defy for hardwoods on my own deck at home.) Don't care about the color.